Espresso is the base of many popular coffee drinks. Previously only the privilege of the coffee bars or coffee aficionado's, modern technology has now brought affordable ways of brewing a top quality product right to you. 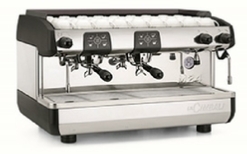 La Cimbali is an internationally accredited Italian manufacturer of espresso and cappuccino machines. They operate in more than one hundred countries and have been producing machines for over 100 years, yes, since 1912. They are based near Milan and export over 70% of their production. 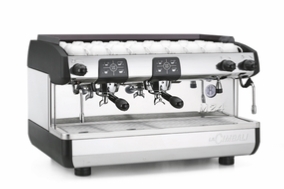 The East London Coffee Company is proud to be able to offer the full Al Cimbali range as an approved distributor. Living and consumption styles have changed over the years, as has the demand for professionally prepared coffees. There is a consumer expectation that accommodation establishments, restaurants and cafe’s offer professionally prepared coffee of the highest standard. At the EL Coffee Company, we feel that the association between us an Al Cimbali is such that we are able to offer a combined professional service, ensuring that our clients are able to offer the freshest coffee’s in the most professional way possible. The increased demand for solutions that simplify the baristas' work and guarantee quality products to consumers make the three way partnership between the roaster; the machine and the modern outlet, essential to the process. The EL Coffee Company undertakes NOT to share your information with anyone and that your information will be used only by the EL Coffee Company for direct communication with you. The Undici range offers style and quality and really affordable prices. 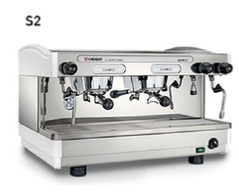 The range starts with the starts with the S2 at R39 512.40 (Inc;.) This machine has two steam wands; two group heads and a hot water supply. The thermo compensated group heads; an Everpure filter system, a scale inhibitor installation kit and an internal volumetric pump complete the picture and you’re ready to open your doors. This machine (and all the other traditional machines) should be accompanied by a Cassadio Enea portion bean grinder (below) as well as a few accessories such as a tamper mat; tamper; machine detergent and a few milk frothing jugs. Note: Various discounts; shipping fees; installation codsts and T’s & C’s do apply as well as rent-to-buy options. Please enquire by completing the form below. Prices are illustrative only and subject to formal quotations. Tampers: R269; 600ml s/s frothing jugs R 249; 1lt R299; tamper mats: R399; 900g detergent: R129; head cleaning brush R59; PVC knock-out box R225. 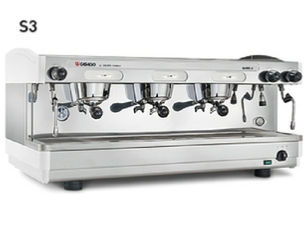 Cassadio Enea digitally controlled professional on demand portion grinder. 1.2 kg hopper capacity; 6.6 kg per hours; LED display; single and double dose selection; fine-tuning adjustment rotating knob/micrometic setting counter. R 11 029.50. See images alongside. We do occasionally have trade-ins or machines on promotion. If you are interested please send us a mail.